The Ford World Rally Team crew of Jari-Matti Latvala and Miikka Anttila claimed their second victory in Rally Sweden today, winning the event by 16.6 seconds after 349.16 competitive kilometres. Former team-mates Mikko Hirvonen and Jarmo Lehtinen finished second for Citroën while Mads Østberg and Jonas Andersson took the final podium position after a hard-fought battle to the finish. In the FIA World Rally Championship standings, Sébastien Loeb continues to lead and the Frenchman has seven points in hand to team-mate Hirvonen. Petter Solberg and Latvala hold third and fourth respectively. And, in the FIA World Rally Championship for Manufacturers, Citroën heads the leaderboard, 10 points ahead of Ford. Today’s route took in two loops of three stages, finishing with the 4.66 kilometre Power Stage in which additional points were awarded to the fastest three drivers through this single stage. Here, Loeb, Solberg and Latvala claimed an additional three, two and one point respectively, adding to their tally in the overall classification. 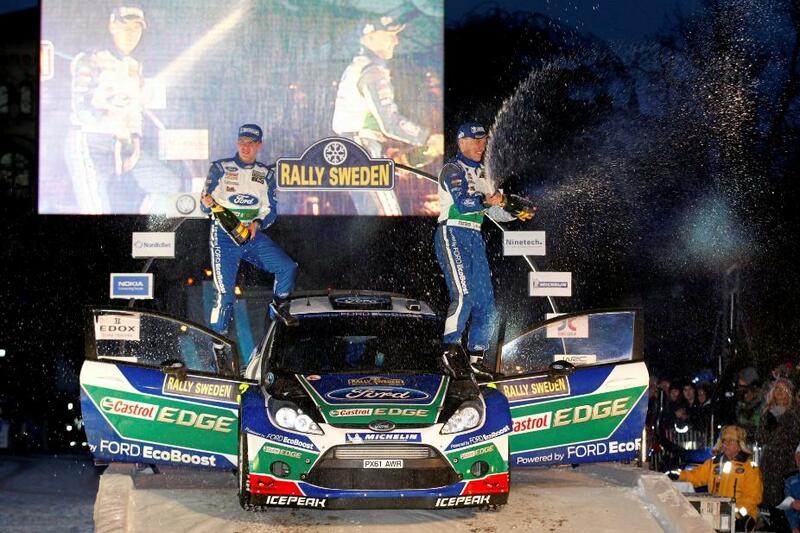 Latvala started the day on a charge, the Finn winning the opening two stages to consolidate his lead over Hirvonen. He ran without problems throughout the day and looked set to claim a commanding victory until hitting a rock this afternoon, causing a puncture that lost him 30 seconds. Coincidentally team-mate Solberg hit exactly the same rock with the same result. However, such was the competition with Østberg, Solberg not only lost 30 seconds but also third position to his fellow countryman. Reigning World Champion Sébastien Loeb finished sixth behind Evgeny Novikov, and all other positions in the top 10 remained unchanged. The FIA World Rally Championship crews now head to the Americas for Rally Mexico (8-11 March).